Increase sales with a doughnut case that is clean, appealing and well-stocked with fresh baked goods. 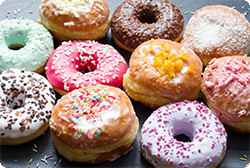 This e-learning module reviews the proper steps for cleaning, stocking and maintaining the store’s doughnut case. Employees learn to check the case often, arrange trays of doughnuts to look plentiful and sanitize empty trays.